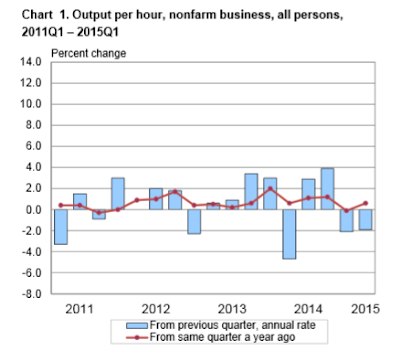 Mish's Global Economic Trend Analysis: Productivity Dives, Wages Rise; Inflation Theory vs. Practice; Technical Recession? 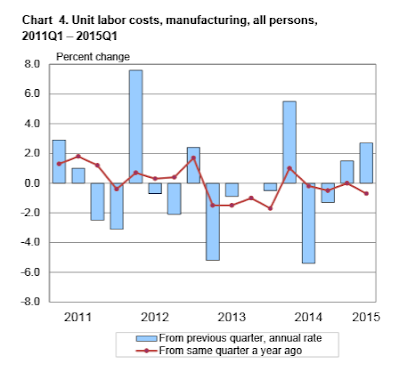 Productivity Dives, Wages Rise; Inflation Theory vs. Practice; Technical Recession? Today's BLS release on Productivity and Costs shows a back-to-back decline in productivity accompanied with rising wages. Productivity is up year-over year, but barely, at 0.6%. Nonfarm business sector labor productivity decreased at a 1.9 percent annual rate during the first quarter of 2015, the U.S. Bureau of Labor Statistics reported today, as output declined 0.2 percent and hours worked increased 1.7 percent . The decline in productivity follows a decline of 2.1 percent in the fourth quarter of 2014. From the first quarter of 2014 to the first quarter of 2015, productivity increased 0.6 percent, reflecting increases in output and hours worked of 3.5 percent and 2.9 percent, respectively. 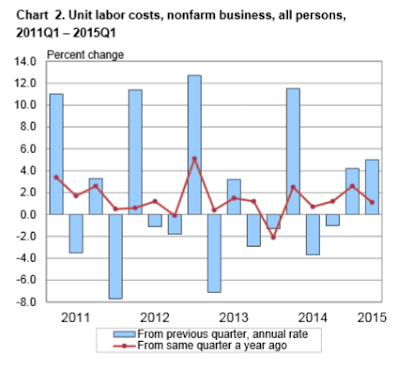 Unit labor costs in the nonfarm business sector increased 5.0 percent in the first quarter of 2015, reflecting a 3.1 percent increase in hourly compensation and a 1.9 percent decline in productivity. Unit labor costs increased 1.1 percent over the last four quarters. Manufacturing sector productivity decreased 1.1 percent in the first quarter of 2015, as output decreased 1.2 percent and hours worked edged down 0.1 percent. Productivity decreased 2.3 percent in the durable manufacturing sector and was unchanged in the nondurable manufacturing sector. 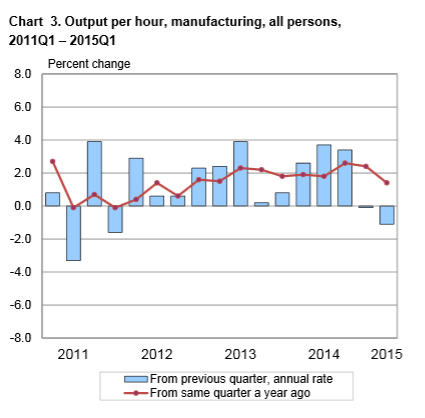 Employee wages are up but output is down two consecutive quarters. This is a bottom line hit to corporate earnings. In theory, the Fed will cheer this development because it adds inflation pressures. Companies will have to raise prices to maintain earnings, and that is just what the Fed foolishly wants. But will businesses, especially fast food and retail stores be able to pass on those costs? And if they do, what about sales? In practice, the Fed will be sorely disappointed with this development. Minimum wage hikes coupled with declining productivity will greatly dampen corporate hiring plans. Marginal stores will close, customers will not like higher prices, store expansions will stall, and retail sales will decline. Imports (think crude) subtract from GDP. 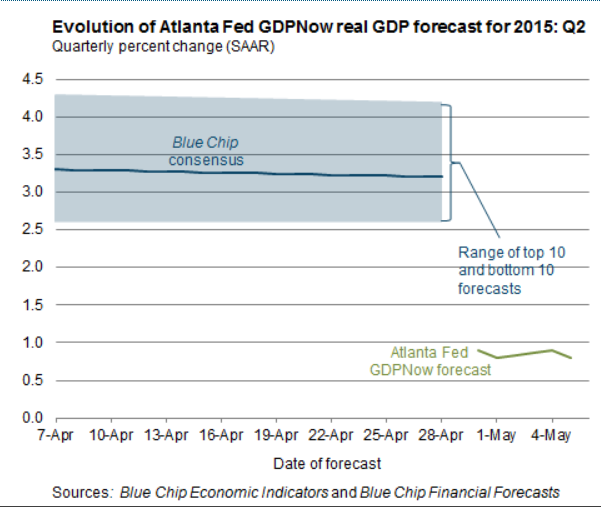 The Fed FOMC committee as opposed to the Atlanta Fed GDPNow forecast says this weakness is "transitory". I suggest Déjà Vu Weather? No, It's a Recession! I expect we will soon hear terms like "technical recession" coupled with the ever-popular phrase "second half recovery" as few economists believe this is the real deal.